Join the discussion on our forums! 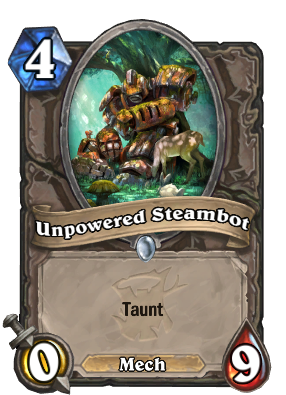 Come discuss Unpowered Steambot over in our dedicated Unpowered Steambot discussion topic. This is probably my favorite card art in the game, and I don't know why. Turns out this card is preeeeeetty good in combo priest. How does a powered down mech napping by a tree have taunt? The only explanation I can think of is minions having an uncontrollable urge to go street fighter bonus round on it. A support card for Armorsmith after Public Defender rotates. Finally, a target for Rampage. So the only way to make it playable is via combo they showed up on stream? That means that it should be left unpowered for ages. AND MOST IMPORTANT: HE CAN SURVIVES AT 2 MAGMA RAGER'S ATTACKS! How many 4 mana cards can do this. Only a couple of cards and how many of them have you ever seen in a meta deck? None! So it s (finally) the perfect tech for Magma Ragers! How could a 0/9 taunt be useful against an aggro deck?